Ht / Wt: 6'3" / 220 lb. 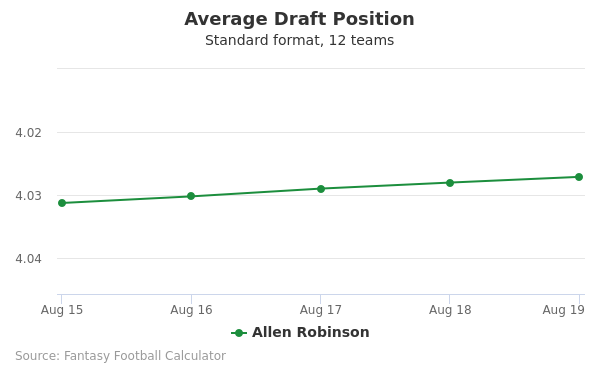 Allen Robinson's fantasy value is measured by his average draft position (ADP) in fantasy football mock drafts. 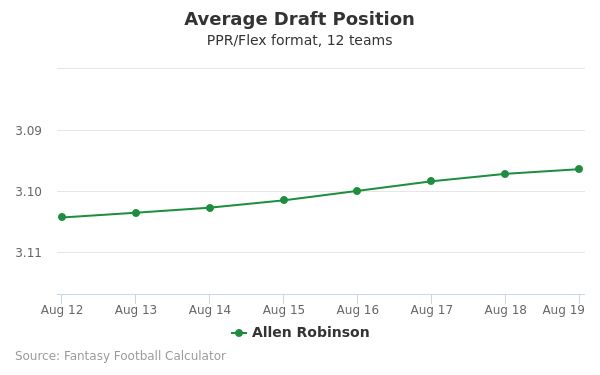 In recent drafts, Robinson's current ADP is 8.02, which indicates that his fantasy outlook is to be the 2nd pick of the 8th round, and 85th selection overall. 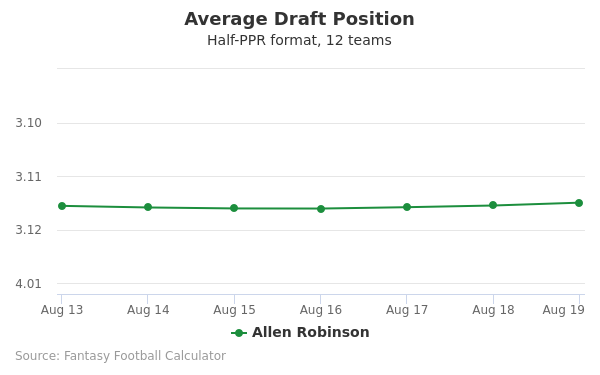 The code below will display a graph that updates every day to show the ADP data for Allen Robinson for the past 30 days in 12-team PPR leagues. Draft Allen Robinson or Chicago Defense? Draft Allen Robinson or Latavius Murray? Draft Allen Robinson or Emmanuel Sanders? Draft Allen Robinson or Jared Goff? Draft Allen Robinson or Christian Kirk? Draft Allen Robinson or Josh Jacobs? Draft Allen Robinson or Royce Freeman? Draft Allen Robinson or Carlos Hyde? Draft Allen Robinson or Jared Cook? Draft Allen Robinson or Marvin Jones? Draft Allen Robinson or Dante Pettis? Draft Allen Robinson or Cam Newton? Draft Allen Robinson or Courtland Sutton? Draft Allen Robinson or DeSean Jackson? Draft Allen Robinson or DK Metcalf? Draft Allen Robinson or Austin Ekeler? Draft Allen Robinson or LA Rams Defense? Draft Allen Robinson or Sterling Shepard? Draft Allen Robinson or Jameis Winston? Draft Allen Robinson or Tom Brady? Draft Allen Robinson or Golden Tate? Draft Allen Robinson or Gus Edwards? Draft Allen Robinson or Matt Breida? Draft Adrian Peterson or Allen Robinson? Draft Allen Robinson or Trey Burton? Start Allen Robinson or Chicago Defense? Start Allen Robinson or Latavius Murray? Start Allen Robinson or Emmanuel Sanders? Start Allen Robinson or Jared Goff? Start Allen Robinson or Christian Kirk? Start Allen Robinson or Josh Jacobs? Start Allen Robinson or Royce Freeman? 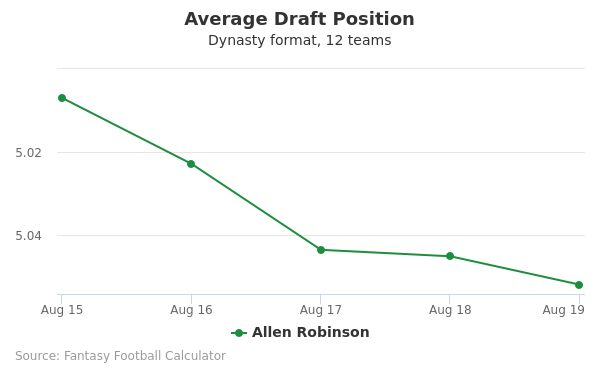 Start Allen Robinson or Carlos Hyde? Start Allen Robinson or Jared Cook? Start Allen Robinson or Marvin Jones? Start Allen Robinson or Dante Pettis? Start Allen Robinson or Cam Newton? Start Allen Robinson or Courtland Sutton? Start Allen Robinson or DeSean Jackson? Start Allen Robinson or DK Metcalf? Start Allen Robinson or Austin Ekeler? Start Allen Robinson or LA Rams Defense? Start Allen Robinson or Sterling Shepard? Start Allen Robinson or Jameis Winston? Start Allen Robinson or Tom Brady? Start Allen Robinson or Golden Tate? Start Allen Robinson or Gus Edwards? Start Allen Robinson or Matt Breida? Start Adrian Peterson or Allen Robinson? Start Allen Robinson or Trey Burton? Allen Bernard Robinson was born on 24th, August 1993, in Detroit, Michigan. His immediate family includes his father and mother (Allen and Tracie Robinson) and his only sister (Ashley). Growing up in Detroit, Robinson exuded great potential as a student and as an athlete. Robinson’s football career began in high school where he attended Orchard Lake St. Mary’s Prep. During his high school career, helped his team win the Michigan Division 3 state championship game. As a senior, Robinson recorded magnificent numbers including two interceptions, two punt return touchdowns, and 720 yards with 44 passing catches accumulating 10 touchdowns. Robinson began his college career in 2011 at Penn State where he made recorded amazing and vital performances. As a freshman he only logged 29 yards from 3 passes, however, the first game he officially started in was against Wisconsin on the road. The game against Wisconsin was vital in determining the Big Ten Leaders Division winner. 2012 (Robinson’s sophomore season) was a major step up in regards to the stats and his overall gameplay. Robinson caught a cumulative 77 passes for 1,013 yards, and 11 touchdowns within 12 games. During this year Robinson led the Big Ten division in all three categories (passes, receiving touchdowns, and receiving yards). A notable achievement within his reception bracket is breaking the team’s previous receiving leaders O.J. McDuffie (1992), and Bobby Engram (1995) whom both tied at 63 receptions. In 2013, Robinson stepped up his stats even higher, which essentially helped him become a draft pick worth considering in the NFL. Robinson played 12 games catching 97 passes for 1,432 yards, and 6 touchdowns. This year he re-claimed his top spots in receptions and receiving yards. Robinson became a vital member of the team in his last season as a Nittany Lion. Robinson was named for the second time to the All-America squad courtesy of Phil Steele. He also claimed his only All-American spot (credits to The Sporting News) in 2013 as well. After a decent college career, Robinson took his talents to the next level. Robinson received the well-deserved moment he dreamed of signifying his entrance into the NFL. The Jacksonville Jaguars drafted Robinson with their second round (61st overall) pick. With this draft pick Robinson signed a four-year contract, which the salary included a signing bonus ($877,718), $3.51 million (overall), and $1.17 million (guaranteed). At his combine appearance, Robinson recorded a 39-inch vertical jump and a great 40 time of 4.6 seconds. Robinson’s rookie season was pretty decent overall. Overall, he finished his first year starting in 8 out of 10 games that he played, 548 receiving yards, 48 receptions, and two touchdowns. A notable game Robinson was a part of included is first touchdown in the NFL against the Cleveland Browns. His first touchdown ultimately helped the Jaguars overcome their 9-game losing streak. Showing much promise, Robinson continued to improve his game during the off-season leading into his second year. Since the Jaguars did not make it to postseason, this was the perfect time to reflect on the NFL experience. Watching film of previous games and hard work definitely showed throughout his progress. In 2015, Robinson came in fresh and ready to win and you can view his highlights here. His season high stats included 10 receptions in a game (against the Tennessee Titans), 80 receptions overall, 14 touchdowns, and 1,400 receiving yards. Robinson cemented his name in the Jaguar’s history by becoming the first to record over 1,000 receiving yards in a complete season since Jimmy Smith (1996). The Jaguars finished the season 5-11, Robinson still had an amazing year. He was able to play in the 2016 Pro Bowl game replacing Calvin Johnson of the Detroit Lions (he declined the offer to play in the game). 2016 was not Robinson’s best year based on stats, nonetheless he maintained decent gameplay. With 73 receptions, 883 receiving yards, and 6 touchdowns, he did the best that he could for the team. The Jaguars finished the 2016 regular season 3-13. If you are looking to keep up with Robinson via social media, there are two outlets you can follow. His Twitter account (@Thee_AR15), and his main website.